Go back in time with a holiday in a thatched cottage on the Isle of Wight. There are so many very pretty thatched cottages in the country, each with its own beautiful garden. Inside the cottage there are often low beams and cosy rooms with period features. Whether is is sentimental or simply romantic, there is a certain group of people who simply adore thatched cottages. For these fans of thatch and olde worlde buildings, click on the following headings to find a hatched cottage on the Isle of Wight for your next self catering holiday. Weekend breaks are usually available in low season, September to May. A stay at a beautiful, cosy and luxurious cottage in the Isle of Wight makes for a great self-catering holiday for you, your friends and loved ones. There are lots of different types of cottages available to rent with cottages available by the sea, in the forest or on a farm, and each has something special which is guaranteed to make your holiday to the Isle of Wight one of the best you’ve ever had. Cottages are generally booked for a week at a time from May to October, weekend breaks are available outwith this period. 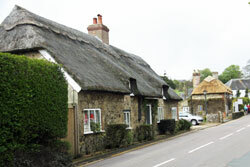 One type of cottage which is has that extra spark is thatched cottages. These enchanting dwellings have a very atmospheric feel about them and we have plenty of thatched cottages in the Isle of Wight for you to choose from. The Isle of Wight is steeped in history, with the imposing Carisbrooke Castle where Charles I was imprisoned before his trial, and Osborne House, a seaside haven for Queen Victoria and Prince Albert, both being located on the island. By staying in a thatched cottage on the Isle of Wight you will feel surrounded by this rich history from the moment you wake up in the mornings, with character pouring out from its slate and stone floors, wood-burning stoves and incredible wooden ceiling beams. The traditional thatching method used on the roofs of these cottages will make your lodgings stand out from the others and you will feel excited to return to your picturesque and charming accommodation after a day out exploring all the Isle of Wight has to offer. If you are planning on taking a self-catering holiday with your partner, then thatched cottages provide a wonderful and romantic atmosphere, unlike any you have felt before. These cottages are perfect for cuddling up on the couch with your loved one by the large old-fashioned fireplace or for sitting on a quaint bench in the cottage’s pretty garden, hand in hand, glancing up at your stunning accommodation every so often and breathing in the glorious fresh air of the Isle of Wight. As well as its history, the Isle of Wight is perfect for nature-lovers with plenty of parks, woodland, forestry and beach to ramble through, and if you feel like a traditional English tea with a scone then there are lots of gorgeous tearooms to sit in with wonderful views outside. Staying at a thatched cottage in the Isle of Wight will make your break to this island complete and will be something you will be telling all the friends and family about. Have a look at our thatched cottages available to rent to make this holiday the best you’ve had yet. We love the charm of the Isle of Wight, the slower pace of time, the good manners and stunning countryside. There is a good variety of self-catering accommodation available on the Isle of Wight, something for all budgets. The following list may help you choose exactly the type of cottage in the Isle of Wight that your heart desires (or pocket permits).